This landmark publication features extraordinary decorative and fine arts from the Mexican viceregal period (1521–1821). The Mexican colonial period has traditionally been considered a dark period in the arts, a long gap between the arrival of the Spaniards and the early twentieth century. Through new and focused scholarship, the exhibition catalogue The Grandeur of Viceregal Mexico demonstrates that just the opposite is true. This landmark publication features extraordinary decorative and fine arts from the Mexican viceregal period (1521-1821). The lavishly illustrated catalogue is written in Spanish and English and, for the first time, presents to American audiences the rich artistic heritage of colonial Mexico. Five insightful essays by Mexican and American specialists explore the confluence of cultures that gives the arts of colonial Mexico a distinctive quality. This distinction, which differentiates the works from the arts of both Spain and other Latin American countries, is not widely understood in either the United States or Mexico. 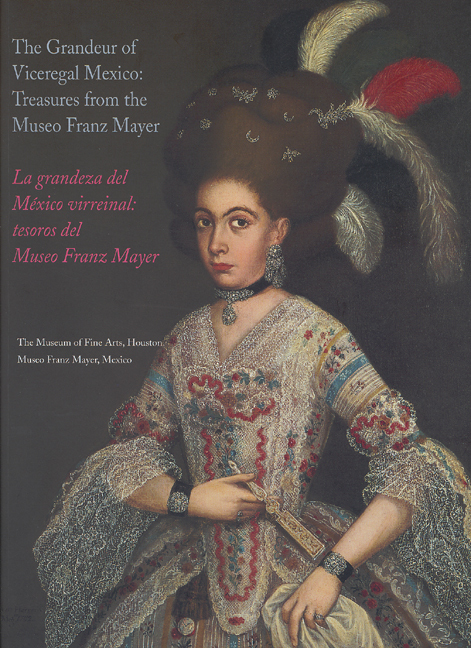 Expert commentaries enable readers to learn in greater depth about the outstanding collection of paintings, sculptures, furniture, ceramics, metals, textiles, featherwork, lacquer, and books housed in the Museo Franz Mayer in Mexico City. Franz Mayer: A Renaissance Man, by Héctor Rivero Borrell M.
In the heart of Mexico City, just by the Alameda garden, stands a magnificent sixteenth-century colonial building that houses the Museo Franz Mayer. This relatively young, but nonetheless extremely important, institution is devoted to the arts of viceregal Mexico, a period that spans the years 1521 to 1821. Among Mexican museums, the Franz Mayer is unique for its in-depth representation of decorative arts from the country's colonial era. Opened to the public in 1986, the museum is the result of the enlightened collecting and philanthropy of Franz Mayer, who devoted much of his adult life to assembling a distinguished collection for the education and enjoyment of the people of Mexico. Mayer, born in Mannheim, Germany, in 1882, came to Mexico in 19o5. There, he entered the world of finance, ultimately amassing a substantial personal fortune. About 1920, Franz Mayer, against the prevailing fashion and taste of his adopted country, began to collect artworks from the colonial period in Mexico. With amazing foresight, Mayer understood that many of the qualities that define the culture of Mexico today are, in fact, derived from the confluence of cultures in the colonial era. Over the years, he assembled the nation's most comprehensive collection of Mexican decorative arts. It long was Mayer's intent that his collection could be made available to the people of his adopted country, and he was among the first in Mexico to donate a private collection to the public. In 1962, he established a trust fund with the Banco de México to support his collection and to safeguard its future. Upon Mayer's death in 1975, a board of trustees that Mayer himself had selected assumed responsibility for the collection and the institution that eventually became the Museo Franz Mayer. Although the collection had been displayed in Mayer's residence, it was apparent that his home was not a suitable location for a public museum. Fortuitously, the trustees were able to secure the Hospital of Saint John of God, a superb colonial building that was built in 1582, as the site of the new museum. By purchasing the colonial building, the trustees saved a monument from destruction and later extensively restored it. We are honored to be working together on this exhibition and the accompanying catalogue. For audiences in the United States, this exhibition provides, for the first time, exposure to the rich texture and fabric that is Mexico's culture as it is manifested in the arts of the colonial era. For the citizens of Mexico, such an exhibition familiarizes audiences with the rich resources of Mexican culture that are represented in the Museo Franz Mayer. We agreed that we would select objects that together would convey the historical and cultural story line of Mexico during the viceregal period. At the same time, the objects selected would be of inherent aesthetic importance. We hope that both goals have been achieved. We would like to thank The Rockefeller Foundation for its early support of this ambitious project. We also wish to express thanks to the National Endowment for the Arts; Continental Airlines; Houston Endowment Inc.; The Favrot Fund; Celina and Alfredo Brener; Caroline Wiess Law; Deloitte &Touche; and The Rowan Foundation. The expert support of the staff at Artes de Mexico was crucial to the editing and translation of the catalogue that accompanies this exhibition. We are grateful to Leslie Greene Bowman at the Henry Francis du Pont Winterthur Museum in Delaware and to Don Bacigalupi at the San Diego Museum of Art for partnering with the Museum of Fine Arts, Houston, and enabling this major exhibition to travel throughout the United States. En el corazón de la ciudad de México, a un costado de la Alameda Central, se yergue un magnífico edificio del siglo XVI que actualmente alberga al Museo Franz Mayer. Esta institución, relativamente nueva, sobresale entre los museos mexicanos por su importante labor en la difusión de las artes decorativas del México virreinal, periodo comprendido entre 1521 y 1821. Abierto al público en 1986, el museo es el resultado de la vocación filantrópica y de coleccionista de Franz Mayer, quien consagró gran parte de su vida a reunir un extraordinario acervo que ahora contribuye a la formación y al deleite del público de México. Mayer, quien naciera en Mannheim, Alemania, en 1882, llegó a México en 1905. En este país incursionó en el mundo de las finanzas, con lo que logró amasar una considerable fortuna. Alrededor de 192o, Franz Mayer, a pesar de ir en contra de la moda y delgusto entonces imperantes en su patria adoptiva, comenzó a coleccionar obras de arte colonial. Poseedor de una extraordinaria visión, pronto comprendió que muchas de las cualidades que definen la cultura contemporánea de México se derivan de la confluencia de culturas ocurrida durante la época colonial. Con los años, consiguió reunir la colección de artes decorativas mexicanas más representativa del país. Durante mucho tiempo tuvo la intención de que los habitantes de su tierra adoptiva tuvieran acceso a este acervo. En 1962, logró su cometido al convertirse en uno de los primeros en donar un acervo privado al pueblo de México. Para dotar la colección con los recursos económicos necesarios que aseguraran su conservación creó un fideicomiso en el Banco de México. Después de su muerte, acaecida en 1975, el patronato que él mismo había elegido asumió la responsabilidad de velar por el acervo y, en consecuencia, por la institución que más tarde se convertiría en el Museo Franz Mayer. Apesar de que las piezas reunidas por Mayer se exhibían en la residencia que éste habitara, los miembros del patronato llegaron a la conclusión de que el inmueble no era adecuado para establecer en él un museo público. De manera fortuita, se les presentó la oportunidad de adquirir el Hospital de San Juan de Dios, un espléndido edificio construido hacia 1582, para convertirlo en la sede del nuevo museo. Con esta adquisición, este edificio colonial no sólo se salvó de ser destruido, sino que además fue sometido a una restauración integral. Es para nosotros un honor haber podido conjuntar, en esta exposición y en el catálogo que la acompaña, el trabajo del personal del Museo Franz Mayer con el del Museum of Fine Arts, Houston. Para el público de Estados Unidos, esta muestra significa una primera aproximación al rico entramado de la cultura de México, y particularmente a su arte virreinal. Para el mexicano, una exposición de esta naturaleza puede resultar una herramienta para familiarizarlo con los vastos recursos culturales de su país, de los cuales el Museo Franz Mayer es un digno representante. Acordamos que la selección de piezas reflejara los aspectos histórico y cultural del periodo colonial, sin por ello pasar por alto su inherente valor estético. Queremos agradecer a The Rockefeller Foundation por el apoyo brindado desde el inicio de este proyecto. Asimismo, expresamos nuestra gratitud al National Endowment for the Arts; a ContinentalAirlines; a Houston Endowment Inc.; a The Favrot Fund; a Celina y Alfredo Brener; a Caroline Wiess Law; a Deloitte & Touche; y a The Rowan Foundation. La ayuda experta de Artes de México fue crucial para la edición y la traducción de este catálogo. También manifestamos nuestro agradecimiento a Leslie Greene Bowman del Henry Francis du Pont Winterthur Museum de Delaware y a Don Bacigalupi del San Diego Museum of Art por asociarse con el Museum of Fine Arts, Houston, y hacer posible que esta magna exposición tuviera varios destinos en Estados Unidos.